music and dance for the millennium! new and innovative music and dance. touch our hearts (26 evocative songs on a 2-CD album). is NOW available at CDBaby! DIAJ (Drummers in a Jam) is an acoustic, ensemble performance group from the San Francisco Bay Area. We create what we call "African-inspired, California-grown" music. Our music blends traditional and original improvisational work with artistry and original lyrics by Ma Boukaka and Robert Bornn. We weave rhythm, melody, and Congolese lyrics together with contemporary instrumental and vocal arrangements played on a variety of drum, percussion, wind, and string instruments. The music introduces new lyrical arrangements of traditional ballads with original harmonics to delight our modern ears and touch our hearts. With our albums and performances, we hope to contribute to building community as we create meaningful and fun artistic experiences. Our art honors our diversity and rejects the gratuitous violence that appears in much entertainment today. In the wake of "ethnic cleansing" in too many parts of the world and hate crimes at home, it has been said that the most important lesson of our era is that each one of us is important and worthy of basic respect. We wish to promote these ideas in our music. We build teams with music. Robert Bornn first learned hand drumming in the '50s on the streets of New York City and in the '90s began to more formally work with talented professional musicians. He has been taught and inspired by Ma Boukaka, Babatunde Olatunji, Abdoulaye Diakite, Arthur Hull and other San Francisco Bay Area teachers and performers. He has been creating improvisational music for more than four decades and founded DIAJ (Drummers in a Jam) for Bay Area drum circles and dancers in the early '90s. In 1997 he created and performed in "Sweet California," an African-inspired performance of original and traditional music and dance, including his original ballet, "California Suite" at Burgess Theater in Menlo Park, California. 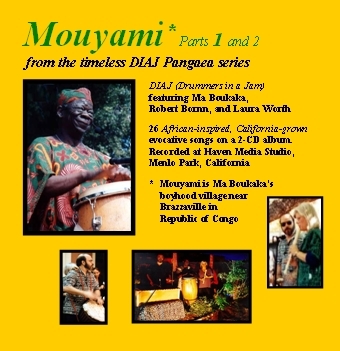 Robert was the founding and artistic director of DIAJ performing group and producer of two DIAJ albums Pangaea: Old World New Visions (on CD) and Mouyami (a 2-CD album). He created, performed, and recorded with DIAJ. He also creates original melodies for the Xylimba, keesansi (kalimba), and tongue drum. In 2001 he created and performed in The World Is You, an original African-inspired music and dance performance to celebrate world human rights. In 2004 Robert released his movie, Ocean's Edge - Spirit's Journey (on DVD) celebrating the lyrical, spiritual, sensuous, and non-violent sides of nature on the Northern California Coast with evocative African-inspired music: six original instrumental ballads by Robert (on xylimba and standing drum) and Laura Worth (on alto recorder). After moving to Vashon Island, Robert and Laura collaborated with local artists to create a celebration of positive dance and music. This evening of community included an immersive light and sound installation by Robert, his film and music, dance, performance art, Vashon Island's Circle of Sound and music by Laura Worth and him as SoundMoments Duo. Robert's second movie, Here and Now: Vashon-Maury Island (on DVD) is an alternative, romantic view of nature in an artistic, narrative-free, and nonviolent style. Evocative natural waterscapes and landscapes on Quartermaster Harbor are set to a medley from the Discovery Suite, Robert's improvisational piano works. Filmed throughout 2005, the film's enchanted naturalism touches each season on Vashon-Maury Island in Washington. Robert currently performs with SoundMoments Duo in the Puget Sound area. He is also recording for his next film in the SeaDrift Media Productions' film series, Ebb and Flow. Ma Boukaka is from Republic of Congo in Central Africa and grew up between the village Ngolibu and the capital city, Brazzaville. He learned to drum by tapping out rhythms in the jungle with his friends. At 14 he went to work as a cook in Brazzaville. Later he became a "pisteur" -- guide, hunter, and cook for a French safari company in Northern Congo and Gabon. On safari, he met Alan Baer, a young American who offered to bring him to the United States. Ma Boukaka accepted and came to the Bay Area in 1959. After the arrival of fellow Congolese in California, Ma Boukaka worked with them for years to produce many shows of Congolese culture through dance, drum, and song. Now, on his own and with others, he continues to create songs and musical arrangements evolving from his traditional Bantu roots. He has taught drumming for decades and continues to initiate beginners into African rhythms and inspire drummers at all levels. He performs with his band, Bole Bantu ("It Takes Two") and has released an album by the same name. He also performs and records with DIAJ (Drummers in a Jam), including the original "Sweet California" ballet, "The World Is You," and his performance on the DIAJ album, Pangaea: Old World, New Visions (lead vocals, conga, ngoma, harmonica, keesansi (kalimba), clave, slit drum). Laura Worth was born and grew up in Kalamazoo, Michigan. She moved to California in 1970 as a young adult and played the soprano recorder for personal enjoyment. In 1998 she began improvising original melodies on the alto recorder for DIAJ. She has also been drumming African-inspired music for more than a decade and enjoys crafting opportunities to make music with others who share her delight in the artistic process. She co-founded DIAJ. She performed and recorded with DIAJ, including her performance on the DIAJ albums, Pangaea: Old World, New Visions and Mouyami. She co-produced the "Sweet California" ballet and The World Is You African-inspired music and fusion dance event to celebrate world human rights. Laura and Robert Bornn have also released a movie entitled Ocean's Edge - Spirit's Journey, with Robert on xylimba and drums and Laura on alto recorder. It celebrates the lyrical, spiritual, sensuous, and non-violent sides of nature on the Northern California Coast. For more than a decade Laura was a student of voice and stage performance as a principal actor in the San Francisco Bay Area's acting and improv ensemble group, Constance Wise Productions. After moving to Vashon Island, Laura and Robert collaborated with local artists to create a celebration of positive dance and music. This evening of community included an immersive light and sound installation by Robert, his film and music, dance, performance art, Vashon Island's Circle of Sound and music by Robert and her as SoundMoments Duo. Laura currently performs with SoundMoments Duo in the Puget Sound area. She is also recording for Robert's next film in the SeaDrift Media Productions' film series, Ebb and Flow (alto recorder, ngoma, and vocals). Various featured guest artists and other musicians and dancers perform in DIAJ events and albums. Some of the other musicians include: Thierry Sornasse, Robert Sellers, Judy Kasle, Wade Peterson, Sean Araneda, Linda Scarborough, Eliza Thomas, Jonathan Fisher, Devorah Ginden, and Nina Serpiello. Would you like to bring DIAJ to your home for friends? premiered the Sweet California ballet, an original drum and dance community performance event at Burgess Theater (Menlo Park). featured at Afribbean (Downtown Mountain View). EMILY's List where they created Beat For Boxer in Senator Barbara Boxer's successful 1998 race for U.S.Senate (San Francisco). entertainment for Incyte corporate TGIF party (Palo Alto). Our CD is NOW available at CDBaby! The World Is You, and Pangaea: Old World, New Visions are trademarks of Robert Bornn. Copyright (c) 1998-2012 by Robert Bornn and Laura Worth.